3 bedrooms, 1.5 bathrooms, sleeps 8 - right on the beach! 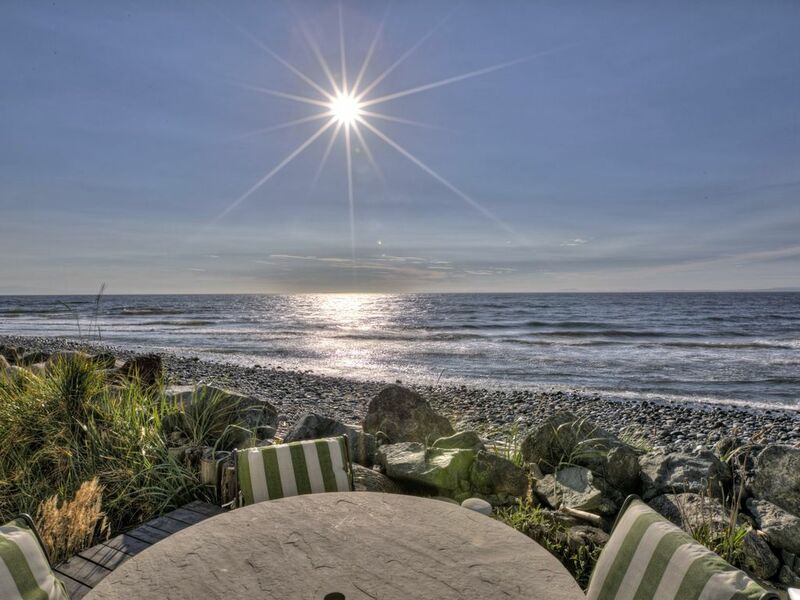 LISTEN to the ocean rumble on the beach on Whidbey Island right outside our newly remodeled, 1750 square foot, 3 bedroom, 1.5 bathroom beachfront home on West Beach. No need to walk to the ocean – just a few steps down the rock bulkhead and you’re already there! Look at the photos to see how close the beach really is. RELAX as you watch the westerly views of the ocean and the beach from the living room, dining room, master bedroom, guest bedroom and upstairs sitting area. ENJOY the life of the ocean and the sunsets from the outdoor hot tub right on the deck in front of the no-bank waterfront. What is the view really like? The best way to know is to check out our video at the top of the page (look in the main photo at the top and click the video button in the upper left corner). From our home at Luna Shores, you can check out the Puget Sound, Olympic Mountains, Lopez Island, San Juan Island and the Strait of Juan de Fuca. You can even see the lights of Victoria, BC at night! The master and guest bedrooms are upstairs and each have queen-sized beds and separate, private Juliet balconies - perfect for whale, dolphin and sunset watching. The additional bedroom is equipped with custom-built bunk beds with extra-long twin mattresses for four kids or adults. Our home will comfortably sleep eight. Luna Shores comes complete with all high thread count linens, a fully equipped kitchen, 150 Mbps high speed Internet and WiFi, cable TV with over 220 channels and high-def, a 60" HDTV flat screen in the living room, fireplace, large capacity washer and dryer, and parking for up to four cars. The main floor features a warm, open kitchen with high-end appliances and quartz countertops, a dining room with seating for eight, a beach viewing area for two, a large, open living room for everyone, and worry-free flooring throughout the down stairs. Our home away from home is located just minutes from Oak Harbor, but secluded from the noise of the city. Close by are the world famous Gallery Golf Course, Fort Ebey State Park, Deception Pass State Park, and the ferry from Coupeville to Port Townsend on the Olympic Peninsula. And if you're looking for something to eat, you can cook for yourself in the newly redesigned kitchen while watching the waves crash on the beach, or you can enjoy one of our favorite local restaurants. The best part about Luna Shores is that Whidbey Island has some of the lowest rainfall in Washington State, making any time of the year right for a Pacific Northwest vacation. While many parts of Washington experience annual rainfall of 30” or more (220” in the Olympic Rain Forest), Whidbey Island will enjoy less than 20” of rain each year since it is located in the Olympic Mountain Rain Shadow. Why not take in the ocean and the views for a most relaxing and memorable vacation? Come and enjoy the spellbinding effects of sun, surf and sea breezes that are never further than your front doors. Luna Shores on the Beach....one way to experience the best of the ocean. Our family resides just north of Whidbey Island in the beautiful Skagit Valley. We actually met each other on Whidbey Island, so it's always had a place in our hearts. We've always had a dream of owning a beach house, but our criteria was very specific. It must be within 2 hours of our home, on the ocean, low-bank waterfront and facing west to see the sunsets. We always thought we'd buy such a place after our boys were through college, but when we found this house and it met all our criteria, we just had to jump on it. Welcome to our beach home - Luna Shores! We love the fact that the beach is always changing. One weekend it will be all covered in cobbles, and just a few weekends later, the beach is almost entirely covered by sand. But don't worry, on days with tides of +1' or lower, you can still get to the sand bar just 60' from the house. Our guests also frequently comment on how well appointed our house is - from a fully stocked kitchen to plenty of towels for the whole family. toilet, Located on the main floor. Downtown Oak Harbor is just 4 miles away with shopping centers and unique shops. Even though you are close to town, West Beach Road is not a major thoroughfare, and it's enjoyably quiet out here. You are right on the beach and can see the ocean in a full 180 degree view! No-bank ocean beachfront. The water is just 10' from the deck at high tide! Swan Lake is just across the street and viewable from the bunk room or the upper landing. Learn about Swan Lake at www.swanlake-preservation.org. You're on the beach. The air conditioning is free! Queen bed linens are high-thread count. A full second set of linens are available for each bed. All beds include pillows, blankets and comforter. Dryer sheets are not recommended for use in this dryer. 150Mbps connection with Wi-Fi access. Both bath towels and separate hot tub towels are provided. Double oven for convenient and quicker cooking. Spice rack, flour, sugar, salt. Includes everything you might need for cooking a complete meal. The sitting bench can be added to the dining room table to provide seating for eight. Comcast cable with HD, HBO, STARZ, Cinemax, Showtime and sports - over 220 channels. The sound bar includes Bluetooth connection capability for streaming music from your phone, tablet or computer. A selection of family-friendly games are available to enjoy. A ton of free movies are included on demand with our Comcast account, and there are a few family-friendly DVDs for you to enjoy, too. If you have any extra movies, feel free to leave them behind. There are three steps leading up to the entry-way to the home. The hot tub sits on the lower deck overlooking the beach and the sunset. Accommodates four people. Thank you Dean and Suzanne for giving us the opportunity to stay in your beautiful ocean front home. The house is decorated so lovely... whoever did the decorating has lovely taste! The home was clean and very well stocked, we found absolutely everything we needed and more! The beds very very comfortable as well. We did take advantage of the waterfront hot tub which was wonderful 😊�. Dean and Suzanne are excellent at communicating and their instructions are very clear and concise. I cannot think of anything bad to say except we were sad to leave. Please do not hesitate if you are looking to book this rental, you will be thrilled with your choice! Thanks again Dean and Suzanne!! We've stayed at many VRBO properties over the years and found Luna Shores to be incredibly well-equipped with everything you could possibly need and more. The decor is so calming, the bunk room incredibly fun, the hot tub is perfectly located on the easy-access deck and the overall views toward the water cannot be beat. Picture an infinity pool - it's like the entire house is designed with that concept, allowing you to feel surrounded by natural beauty. A wonderful escape and a great value! My husband, two boys (4mo and 4yo) and I had a great weekend at your lovely oak harbor house. What a beautiful location! The house was clean, the kitchen was well stocked, and it was very comfortable. The location was great, we walked to Joseph Whidbey state park and it was a short drive to deception pass. Our stay was completely perfect! The house was easy to get to as well as into and had all the amenities easy to access. The owners were exceptionally easy to contact for questions. The most important part was that the house is absolutely stunning and so comfortable! It’s an absolutely unbeatable experience - highly recommend it! Thank you so much for staying with us and for the great review. We absolutely love sharing our home with others, and we're especially grateful when others appreciate it like we do. Come back soon! Gorgeous Home with a Stunning View! We had the most wonderful time staying at this beautiful beach front home. There were 4 adults and 4 kids in our group and we had plenty of room. It was so relaxing to be able to sit in the living room and enjoy the view of the water just steps away. It was fun to get out and see the island, but the house was so beautiful we loved hanging out there as well!! I would highly recommend this property to anyone looking for a beach getaway in the summer or winter!! We feel the same way when we go there - sitting in the living room and watching the water is so amazing, it's hard to leave the house! We hope you come back and enjoy the view again soon. Such welcoming host with a jar of cookies and a bottle of wine. The home was beautiful and clean. Eagles soaring close to the windows. We had a relaxing weekend and would definitely consider coming back yearly. Aren't the eagles fabulous? We'd love to take credit for their flight schedule, but it's one thing we just can't control. We're so happy you enjoyed our home and the view. Looking forward to having you back soon!